In the early 1990’s, the cells in your body were like any other body part that could be used by a physician and moved from one area to the next. They were body parts like a kidney or a heart. That was before an unprecedented power grab by the FDA. 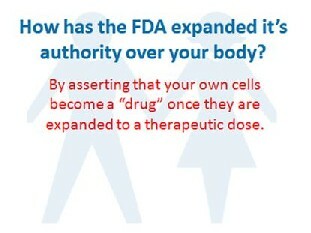 In the late 1990s, the FDA proposed that the cells in your body should be made drugs. They were met with stiff resistance. They ultimately decided, that if the cells were at all made more potent by growing them to bigger numbers, they would be drugs, even though they were still your cells. This was known as the “minimal manipulation” rule later codified in 21 CFR 1271.1-3. 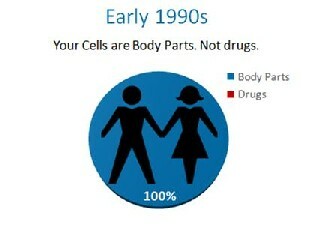 In the 1990’s this only applied to someone else’s cells that were manufactured like drugs, so this made some sense. 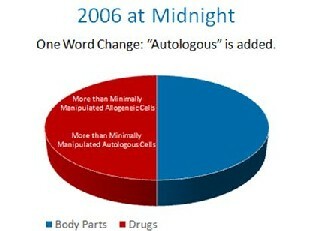 The FDA, without the proper notice and comment making period required by the Administrative Procedures Act, made a one word midnight change in the 2006 federal register. It changed a single word from “another” to “a”. By doing this, it’s regulatory authority was expanded from simple control over someone’s cells used as a transplant from “another” person to all cells from “a” person. With this one work change, FDA granted itself sweeping new authority over your body. Up until 2008, it was assumed that FDA only meant to apply it’s rules to pharma companies who were processing cells. 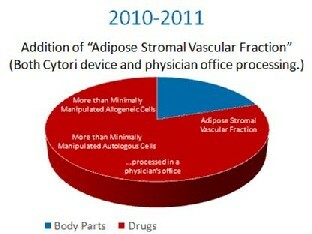 Then in 2008, FDA went after a physician’s office that was using the patients own cells and treated the small doctor’s office like a large Pharma company. This necessitated a suit by the doctor’s office against FDA, but this chain of events now extended FDA’s authority even further, as now your local family doctor was suddenly under the same cell based regulations as Pfizer. In 2010 and 2011, the FDA decided to place fat tissue processed at the patient’s bedside to release stem cells into the same category as prescription drugs. They made this intention clear through letters to several parties that asked the Tissue Reference Group whether this simple processing of fat was something FDA intended to control. In addition, it submitted Warning Letters to Intellicell and a Dr. Young, codifying it’s intent to turn fat tissue into a drug. 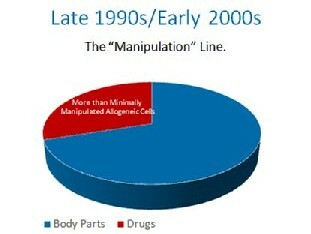 So as you can see, FDA has gone from no control over your body’s stem cells as drugs in the 1990’s, to classifying an ever increasing number of you body tissues as drugs. 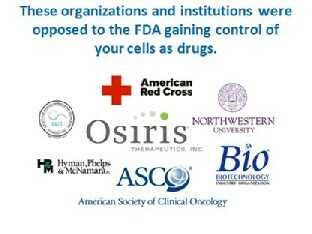 This is despite massive opposition from these industry groups. What is the impact of classifying simple medical procedures as prescription drugs? The FDA has taken procedures that should by now be routinely performed as the practice of medicine, and instead placed them into a glacially slow drug approval process. Countless sick patients have been denied access to their own stem cells that may well cure or mitigate their disease. Share this page with your friends. 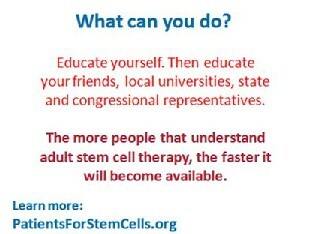 Ask your local university if they have a focus on adult stem cell research, specifically autologous mesenchymal stem cells, expanded to a therapeutic dose. Educate your state and congressional representatives. Citizens need to take charge of the way their body parts are being regulated. FDA Oversight of Autologous Stem Cell Therapies: Legitimate Regulation of Drugs and Devices or Groundless Interference with the Practice of Medicine? Mary Ann Chirba, J.D., D.Sc., M.P.H. This entry was posted in Education and tagged adult stem cells, autologous, celltex, FDA, mesenchymal, regenerative medicine, regenexx, stem cells on 05/19/2013 by patients. Herpes and Multiples Sclerosis – MultipleSclerosis.net | Herpes Survival Kit on 4 part series published in Lamar University Press on evolving role of stem cell therapy in American medicine. 054: Claire Hooper's Car Accident led to her Knee and Back Injury and Disability on 4 part series published in Lamar University Press on evolving role of stem cell therapy in American medicine. stemcellboss on How Safe Are Stem Cells? Bad Behavior has blocked 547 access attempts in the last 7 days.